In order to establish new partnerships between the Sri Lankan and Nordic travel industry – and to increase awareness of Sri Lanka among the Nordic travel trade – Related was in September 2016 appointed to organize a Nordic roadshow for the Sri Lanka Tourism Promotion Bureau. The roadshow included workshops in the four Nordic capitals with the aim of informing and inspiring the Nordic travel agents and tour operators on travels to Sri Lanka, and to provide the more than 25 Sri Lankan stakeholders with a platform to get in touch with the Nordic agents. Each workshop was held in an exclusive venue in the central parts of each city. All four workshops included a presentation of the destination and a B2B session. 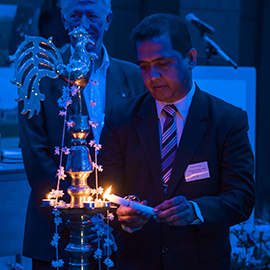 At each workshop, the event was opened by the traditional ceremony with the lighting of the oil lamp, followed by an opening speech, presentations, and a Q&A session. Afterwards, there were individual B2B meetings – either in a separate room, or in the same room as the presentations were held – where each Sri Lankan partner/supplier were provided with a table and four chairs. After each event, the Nordic attendees were given a Sri Lanka goodie bag with further information and a souvenir. A total of 156 Nordic agents and 13 media representatives attended the shows, which both established new partnerships and gave the Nordic travel professionals new and increased knowledge of Sri Lanka as well as improved awareness of the destination within the Nordic travel industry.